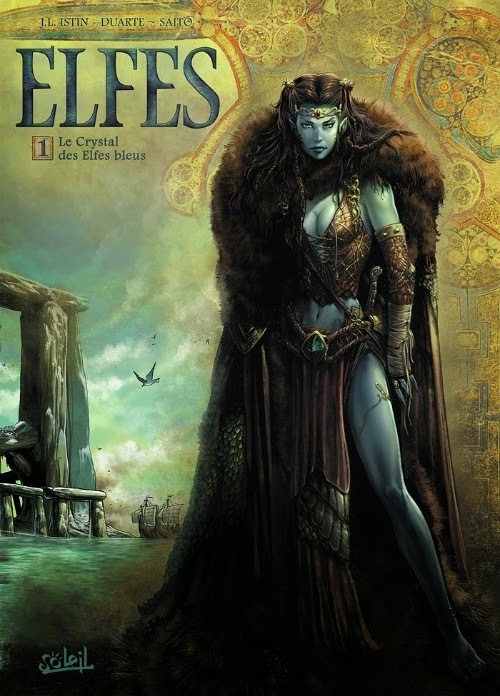 “The Blue Elves’ Crystal” (Elves, Volume 1) / "Le Crystal des Elfes Bleus"
I could trace my love for the elves to my first fantasy books that landed on my reading table, J.R.R. Tolkien’s “The Lord of the Rings” and R.A. Salvatore’s “Dark Elf” novels. Or I could go further back in time and discover that this trail begins with the German fairy tales I enjoyed in my childhood years. Nonetheless, the attraction remains as strong as in those magical times and I find myself unable to resist to books such as it is Jean-Luc Istin and Kyko Duarte’s “The Blue Elves’ Crystal”. Returning from a journey the blue elf Lanawyn and her human friend Turin reach the city of Ennlya only to discover that all its inhabitants have been killed. The evidence they uncover points towards the human clan of Yrlanis as responsible for the atrocity. At the same time, in the island city of Elsémur, Vaalann, a young blue elf, appears to be the chosen of whom an old prophecy speaks of, the one who will control the powerful blue elves’ crystal. Jean-Luc Istin’s “The Blue Elves’ Crystal” is not a groundbreaking story, most of its elements are very familiar. But if this tale doesn’t score points for originality, it still delivers an interesting and entertaining story. Two arcs go in parallel for the most part of the graphic novel, the criminal investigation in the Ennlya’s massacre and Vaalann’s attempt in fulfilling the blue elves’ old prophecy. The alternation between the two makes the intrigue work better, provides good suspense and allows the plot to accumulate enough mystery for the final twist to be effective. Blood runs hot within the story as well, there is plenty of action to be had, both on grander and smaller scales, some tense encounters and presence of mythical creatures that quicken the pace nicely and add something extra to the tale. The characters are pleasant as well. “The Blue Elves’ Crystal” 54 pages does not offer much space for the characters to develop properly, but they still manage to be lively to a certain extent. Little elements of their personalities make themselves present and the reader can guess a couple of other aspects regarding the characters from here. They are not memorable, but there is no regret in spending time in their company either. The liveliness of the characters gains potency from the drawings of Kyko Duarte as well. His art is wonderful, the personalities and emotions well captured in all the characters, the scenes captivating and the landscapes and locations represented wonderfully. Kyko Duarte’s art complements successfully the story, it intensifies the enjoyment of this little graphic novel and provides some splendid frameworks. The minor details tend to get blurred into a mass within a couple of cadres, but that might be put on perfectionist demands rather than the fault of the artist. The overall result obtained by Kyko Duarte with each frame is nothing but satisfying. I pursued my attraction for the elves to Jean-Luc Istin and Kyko Duarte’s comic book and I feel no disappointment in doing so. “The Blue Elves’ Crystal” is an epic fantasy that doesn’t defy the standards and does not challenge the reader, but it is a fun and relaxing story. And since this is the first comics in a series of independent stories set in a universe of elves I hope that the next volumes would keep fueling the joy of reading kindled by “The Blue Elves’ Crystal”.